In "Managing Oneself" Peter Drucker talks about how different people have different ways of receiving information. I realised that hearing is much more effective for me than reading and so since then I only really listen to audio books. Incidentally, that book is 100% free on audible and is shorter than most podcasts. Well worth your time. We live in an age of unprecedented opportunity: with ambition, drive, and talent, you can rise to the top of your chosen profession regardless of where you started out. But with opportunity comes responsibility. Companies today aren't managing their knowledge workers careers. Instead, you must be your own chief executive officer. That means it's up to you to carve out your place in the world and know when to change course. And it's up to you to keep yourself engaged and productive during a career that may span some 50 years. 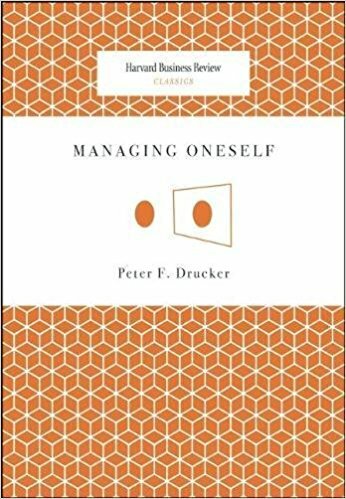 In Managing Oneself, Peter Drucker explains how to do it. The keys: Cultivate a deep understanding of yourself by identifying your most valuable strengths and most dangerous weaknesses; Articulate how you learn and work with others and what your most deeply held values are; and Describe the type of work environment where you can make the greatest contribution. Only when you operate with a combination of your strengths and self-knowledge can you achieve true and lasting excellence. Managing Oneself identifies the probing questions you need to ask to gain the insights essential for taking charge of your career. Peter Drucker was a writer, teacher, and consultant. His 34 books have been published in more than 70 languages. He founded the Peter F. Drucker Foundation for Nonprofit Management, and counseled 13 governments, public services institutions, and major corporations. ©2019 The CEO Library. All rights reserved. As an Amazon Associate we earn from qualifying purchases.